The bidding war for Fox is over, but Comcast plans to continue its efforts to acquire a major British TV service. Comcast is bowing out of the high-stakes bidding for a large portion of 21st Century Fox. The company issued a statement Thursday morning saying that it was dropping out of the bidding for Fox's cable TV and international distribution assets, which Disney has agreed to buy. "Comcast does not intend to pursue further the acquisition of the Twenty-First Century Fox assets, and instead, will focus on our recommended offer for Sky," the company said in a statement. Comcast, which owns the parent company of NBC News, NBCUniversal, had initially approached Fox executive chairman Rupert Murdoch late last year, but talks didn’t go anywhere, partly because Fox feared the regulatory risks of such a deal. 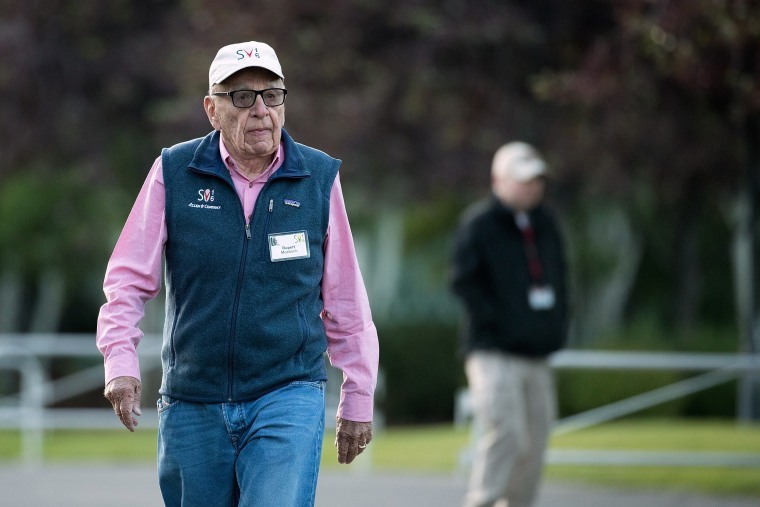 Murdoch then began talking to Disney CEO Bob Iger, who offered $52.4 billion for major pieces of Fox including its movie and TV production studios as well as its international channels. Comcast responded with an increased offer of $65 billion before Disney topped the bidding with $70 billion. Brian L. Roberts, chairman and CEO of Comcast, in a statement congratulated Iger "and the team at Disney and commend the Murdoch family and Fox for creating such a desirable and respected company." The Fox-Disney deal is already approved by the Justice Department and the two firms can now begin the work of consolidating their acquisition after Fox shareholders approve the vote on July 27. Among the Fox assets to be transferred is a 39 percent stake in the British satellite broadcaster Sky, which Comcast is also trying to acquire. Comcast is offering $34 billion to shareholders, topping Fox's bid of $32.5 billion for the remaining 61 percent of the company. Disney will now probably begin the process of selling off the 22 regional sports networks it will acquire from Fox. It agreed to shed those assets in order to win Justice Department approval. Some investors and analysts had questioned the wisdom of Comcast's pursuit of Fox, noting that it would need to take on a large amount of debt as part of a deal. Comcast shares rose by 3 percent in pre-market trading after news of the company's decision broke.